If you were in the North Bay exactly one year ago, you probably remember the wind. Powerful gusts of nearly 80 miles per hour helped fuel some of the deadliest and most destructive fires in state history as they burned at a rate of more than a football field every minute. For composer Paul Dooley that was the starting point for "Sonoma Strong," an original composition commissioned by the Santa Rosa Symphony. The symphony debuted the work at a free concert this summer and has decided to perform it again for its season opener on Oct. 6, 7 and 8. "I wanted to capture some of the wind and some of the energy from that night [on Oct. 8 last year]," said Dooley, a Santa Rosa native who teaches at the University of Michigan. To do that he used something you won't typically find in a symphony: massive musical tubes called whirlies. You swing them around over your head and they make a soft whistling sound. "The swirling of the whirlies sort of looks a little bit like a siren — it can kind of evoke that feeling," he said. "But it's also a very beautiful sound, so I figured it might be an elegant way to capture some of the energy from that night." The whirlies are set to multiple trumpet solos. After a while, the strings come in and the piece begins to build. "And that transforms into a sort of ominous climax, marking the halfway point of the piece," Dooley said. That climax evokes the devastation of the October fires, which destroyed thousands of homes and killed 44 people — devastation that was certainly felt by the Santa Rosa Symphony. According to Santa Rosa Symphony President and CEO Alan Silow, 22 families closely connected to the symphony lost their homes in the fires, including members of the board, musicians and staff. A number of the organizations' major donors and subscribers also lost their homes. The symphony had to cancel and postpone concerts and call off their annual donation campaign, as many of the symphony's staff were forced to evacuate from their homes. "We still paid our staff for the time they had to miss, we still paid our musicians for the concerts we had to cancel, because we thought that was the right thing to do," Silow said. "But obviously that also impacted us, fiscally speaking, as well." But now, Silow said, they're beginning to move toward recovery. "I don't know if I would say it's triumph, but we're definitely in recovery," he said. "And I think whenever tragedies hit like that, the silver lining is it brings out the best of people. It has definitely brought out the best of people in Sonoma County." 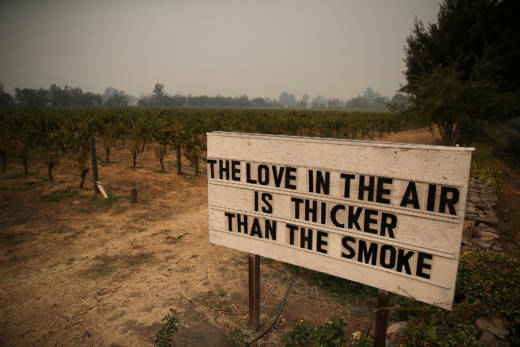 That's a sentiment that Dooley worked to capture in "Sonoma Strong." After the piece's ominous climax, there's a marked change in tone. New instruments enter. The key changes. "The piece transitions to what I would call the rebirth," he said. "And it's the first entrance of the woodwinds: the flutes, the oboes, the clarinets and the bassoons." During the "rebirth" portion, Dooley builds off of the themes he established at the beginning of the piece but with new instruments and a different tone, giving it a "more heroic and celebratory fashion and feel," according to Dooley. That heroism and celebration — the feeling of triumph that comes along with rebuilding — is what Dooley hopes sticks with the audience. "I'm hoping that through the transformation of the piece, people are somewhat reminded of what happened last year, but are given a new outlook. Or the piece helps them transform their view of the horror of [the wildfires] into something positive and something that can bring the community together, as the construction and rebuilding continues," he said. The Santa Rosa Symphony will perform "Sonoma Strong" on Monday, Oct. 8 at 6:30 pm at the Green Music Center at Sonoma State University.